We have talked about PowerArchiver before on Raymond.cc, and it’s a fully featured archiver with many extra features added on. Apart from support for creating popular archives like CAB, ZIP, ZIPX and 7z, it can also open and extract a large number of formats and only really the rarest formats might be missing. Other features include cloud integration with Azure, S3, Dropbox, Google Drive, SkyDrive and Box, a fully featured FTP client, built in CD/DVD/BDR burner, virtual drive mounter, automated backup, batch archive creation and full encryption options. UltimateZip is another program that tries to offer more features over and above the simple function of archiving and extracting. This includes burning the archive straight to CD/DVD, uploading directly to FTP servers and creating backup jobs to archive and backup files and folders in a few clicks. 9 archive formats are supported to create including 7z, ZIPX and CAB, several more like RAR, ZOO, ACE and ARC can be opened and extracted. Batch options allow you to create or extract several archives at once. WinArchiver tries its best to be more than just another archiver by offering useful features taken from another one of its programs, the excellent PowerISO. It can create a disc image from optical media and also do the reverse and write disc images out to disc. WinArchiver can also take disc image files and mount them to a virtual drive so you can use mounted images instead of real media. 5 different archive formats can be created and around a further 50 types of archive can be decompressed. Be aware adware is offered during install. A program which can UnRAR is essential if you download a lot because many online files are packed using WinRAR. This is probably the most popular shareware archiving program around, it’s fast, simple to use and RAR compression is better than ZIP and some other formats. Recovery records also help with corrupt archives. The new RAR5 format introduced in WinRAR 5.0 improves many areas of the RAR format, including decompression speed, security and larger dictionaries for 64-bit versions to help improve the compression ratio a bit further. WinZip is one of the original archivers and has been around for over 20 years, slowly adding more functions and features to the program as it evolves. It can still only compress to ZIP or ZIPX formats (XZ method is new for v18), but just about all the well known formats can be extracted including 7z, ISO, RAR, IMG and CAB. To make up for the lack of compression options, WinZip has other features such as uploading directly to media, the cloud and social networks, convert files to PDF, archive preview, image converter and an auto backup function. Watch for the adware during install. Some archivers you may know of were not tested for various reasons. ZipGenius has never been updated to fix a known issue which renders the right click context menu useless and in many cases crashes Explorer. IZArc has gained a bad reputation of being bundled with adware and also appears to offer some you cannot opt out of. FuzeZip and jZip are other archiving tools with issues relating to adware. Development seems to have stopped for StuffIt, KGB Archiver and TUGZip, none have been updated since 2009 or earlier. WinUHA has not been updated since 2005, UHARC not since 2007. Each test was run on an Intel Core Quad Q6600 CPU @ 2.4GHz with 4GB of DDR2 RAM. The operating system is Windows 7 64-bit and 64-bit archiver versions were used if available for download, some others install and run 64-bit versions automatically. The extraction tests were run from one HDD to another. Archive test #1: 20,196 files with an overall size of 2.54GB. It’s a complete mixture of file types and they range in size from a few bytes up to 100MB. Archive test #2: A 1.91GB single VMDK virtual image from Microsoft of Windows XP. Archive test #3: 129 documents totalling 200MB. These are PDF, XLS(X), CSV, DOC(X), TXT and RTF files. Unarchive test #1: Decompress all the files from Archive test #1. Unarchive test #2: Decompress the VMDK file from Archive test #2. All 5 tests were run once for ZIP compression and once for Max compression. The compression level in the ZIP test was simply set to the highest available in each archiver. Things like dictionary and word size were left at defaults as it would take huge amounts of time to test every single setting. The compression method was Deflate, this is the standard method for ZIP and the most compatible. Deflate64 and other methods are not universally compatible, Windows XP’s built in ZIP being one example which won’t recognize non Deflate ZIPs. For the Maximum compression tests each archiver was set to the best compression format it had to offer, and then setting its level to maximum, the method was changed if we believed if would improve performance. Extra settings like dictionary or word size were left alone. 7-Zip has an issue with the ZIP level set to Ultra and the standard method of Deflate. After 15 minutes, longer tests were still under 30% complete. For the test we had to use a compression level of Normal to finish in a reasonable time. Most archivers using 7-Zip libraries to compress ZIP files have the same problem, including Hamster, WinArchiver, PeaZip and KuaiZip. UltimateZip has a similar issue to 7-Zip compressing ZIP files at the highest setting. We used Normal compression here as well. It also failed using 7z Ultra LZMA2 in Max Compression test #1, for that one test we had to use Maximum. FreeArc is unable to create ZIP files so was excluded from the ZIP test. The Arc Ultra setting wasn’t used as it produced the same file sizes as Maximum but took considerably longer. ALZip’s Max Compression test #1 using EGG was abandoned after 60 minutes as it said completion time was over 5 hours! Other EGG settings produced worse than ZIP compression so were not tested. PKZIP’s best format is ZIP and was left out of the Max Compression tests. Using ZIP/LZMA is possible which is basically ZIPX, but times were totally unrealistic. 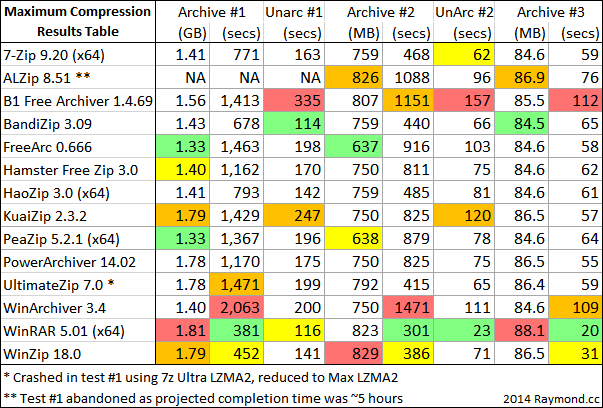 PowerArchiver have acknowledged the program crashes if they allow 7z LZMA2 compression to use more than 1 CPU core, so LZMA was used for the Max compression tests. Hamster Free Zip automatically skips and doesn’t archive files with the hidden or system attribute set and also icon shortcuts. Be careful as there is no option to enable them to be compressed and you are not warned they are excluded. Windows 7’s built in ZIP was included as a reference. The results table for the ZIP compression test is below, green is the best score, yellow is second, red is last and orange next to last. All timings are in seconds (secs) and file sizes are either Gigabytes (GB) or Megabytes (MB). Note, not all colors are used in every column. The (x64) shows we used a 64-bit version if one was available. Winners – WinRAR won 2 timed extract tests, PowerArchiver won 2 timed compress tests while 7-Zip won the other using Normal compression. Bandizip is also worth a mention with an equal win and couple of seconds. WinZip impressively got the outright smallest file size in 2 tests and didn’t suffer too much with extra compression time. Losers – UltimateZip produced truly awful performance in both speed and output file size and was last in 5 of 8 tests, and that was on Normal setting. B1 Free was also very slow with 1 last and 3 second lasts. The results for the maximum compression test are below, color codes are the same. Winners – ARC has the best compression ratio with both FreeArc and PeaZip winning the bigger tests, it takes almost twice as long to compress though than a good 7z compressor. Bandizip also produced some good scores like the ZIP test. WinRAR won pretty much all the speed tests with WinZip not far behind, but this comes at a heavy price (see Losers). Losers – WinRAR and WinZip were fast because their compression formats (RAR5 and ZIPX) don’t compress anywhere near as well as the other formats tested, so score badly in output file size. WinArchiver 7z compression was terrible, being 10 minutes slower than anything else in one test and 5 minutes slower in another, certainly not worth the tiny gain in file size. B1’s own format also proved to be painfully slow while producing OK file sizes. KuaiZip was quite a slow tool to extract. The ZIP compression test shows all archivers are very close on output file size due to the Deflate method, the big difference is the time taken meaning faster programs are better choices. PowerArchiver and WinRAR were the fastest shareware tools and fastest overall to (de)compress. For free tools, BandiZip and HaoZip were quite fast, 7-Zip and Hamster Free were also good considering their compression levels had to be dropped. WinZip’s slightly smaller archives are nice if you value the extra few Megabytes saved. The maximum compression test varies as different programs used the best format they have available. FreeArc and PeaZip both produced the smallest file sizes using ARC but you pay with a vastly increased compression time. RAR5 (WinRAR) and ZIPX (WinZip) simply can’t match other formats for compression but are quicker. 7-Zip, HaoZip and BandiZip produced small file sizes compared to others using 7z and were fast, thanks in part to LZMA2. We ran a few small scale tests to see how a 32-bit archiver compares against its own 64-bit version, such as WinRAR or 7-Zip. There was little to no difference in speed or file size for the ZIP tests while max compression tests differed slightly. A smaller dictionary size was needed in 7-Zip to get memory usage for compressing under 2GB, this increases speed and the archive size slightly. WinRAR’s default maximum setting didn’t cause an issue and produced similar results. All in all, if you compress often using ZIP, PowerArchiver is the fastest option available. If you prefer overall speed above more compression, WinRAR or WinZip are fair choices. The archivers that offer a good blend of performance and a high compression ratio are free programs, 7-Zip, HaoZip and BandiZip (and PeaZip). Obviously this test is not designed to find the “best” overall archiver as that depends on what you want most; speed, compression, encryption, ease of use, extra features etc. What it does show is the best compression or speed a program is likely to offer with a couple of mouse clicks. I know this is an old article, but did anyone test “Gnu Zip”? I don’t know if the compression ratio is very good, but I’m hearing it’s DE-compression speed beats all others. WinRar is not listed in any other place then the comment section. I’ll give you a clue, there is quite clearly more than one page to this article.……. PeaZip is better option for alternative for winzip. PeaZip is easy to use and very fast working software. all zip and 7zip are the best alternatives for winzip i have tried bot of them they can easily replace winzip .thank you for sharing the list of the alternatives of winzip.It’s very helpful. 7z works with Ultra setting up from 6GB RAM it’s rather system requirement than issue. Tested on Windows 7 66bit, as in upper benchmark. The test doesn’t say if Solid compression was used and what the dictionary sizes chosen were. Harmonizing them across all archivers would be fair regardless of what the author has chosen for their “best” preset. I think FreeArc has a huge dict (and memory requirements) by default. Obviously the VDMK test was solid because it consists of one file. WinRAR has the most user friendly and accurate design. All options are discoverable from the GUI. PeaZip and PA unfortunately always follow the latest design trends, and look quite ugly now. It was the ribbon here, now they have Metro style. The corporate bloat starts at their installers already. While FreeArc compresses well, only a few programs can extract this experimental format. I think it is unreliable. 7-Zip Zstandard is a good new format, combining fast speed and large dictionary. Other formats offer either one (Zip) or the other (Lzma), with RAR somewhere inbetween on the scale, but not free. Zstd is good for backups where duplicate files are likely to occur, or large file transfers or installs that have to be done in reasonble time. The default settings were used for each archiver, so if solid compression is a default option, it is used. The dictionary size is the same. Most users aren’t likely to play around with settings like those, that’s why we went with the settings we did. Among the free programs, “BANDIZIP” seems to be the best. I have been using this program for a long time. very satisfied. Yes, especially that “smart” feature, it pretty cool and I do not care about whether or not root folder in zip file anymore. Great write. For a simpleton like me though, I prefer using online tools that don’t require me to download software (I’m currently using WebZip.co, but there are a few other good ones as well). The only caveat is I think they mostly support ZIP only. Several years after and yet this article still compells comments from readers! Kudos for this well put analysis. I’ve been trying out archives hoping to find the best (I prefer compression ratio over speed) and this article spared me a lot of time and effort trying them all out. My top choice has been 7z LZMA2 (using 7-zip), until a few days ago when I tried Arc (using FreeArc). Even though it lacks splitting into volumes/parts, I’ve had better compression ratios (38%) while archiving huge games. Since I burn the archives onto DVDs, splitting is a must have feature for me. My workaround has been simple; I simply zip (using Winrar) the arc output of FreeArc and split them into DVD5-fit parts, but with compression level set to “store” or “none”, so that extraction is a two-stage process, one being the extraction of the multi-part zip archive, and the second being the extraction of the arc archive. Again, kudos for putting this information up, came in really handy. Did you even read the results? The size of archive created and time it took is all in the table. I wish you had used more than a maximum 2.54 GB size data set; that really isn’t very much. Right now I’m looking to compress the contents of an external USB drive; the drive is 250 GB but the data total is only 106 GB of that. But that 106 GB is still way larger than the sizes used in any of the tests performed. Granted, I’m not sure when the tests were done, but the Core 2 Quad Q6600 CPU dates from 2007 and that probably represents 5 “generations” or so in computer time. Still, your results are good to know as they give a general idea ( eg. I don’t think UltimateZip would win any contests on an i5 at the present time either )… thanks for this. You raise some interesting points but trying to compress 100GB+ for testing would have taken simply far too long. We would have needed to compress that 100GB 30 separate times and decompressed it another 30 times, that is simply unworkable. In my opinion using the sizes we did in all the tests are far closer to what the average user is going compress, compressing the sizes you mention are rare and for niche purposes only. As for the hardware, that is simply what I have in my test PC and even though it’s old, it still compares reasonably well with the average PC or laptop CPU of today. We could have used an i7 system with 16GB of RAM, but again, that is unrepresentative of what the majority of people have. Some sites like to test on high end hardware, we like to test or normal hardware. How about compressing 4K series? One episode has 20GB already. gr8 job you’ve done and it was described so purely clearly. thank you so much for valuable effort to let is know more about compressing.good luck! Thanks for the throughout article. A remark for ZIP Compression 7-Zip and PeaZip share the same results. What I’m left to wonder is how archivers compare using their best compression format (own’s format? i.e. WinRar -> Rar; 7-Zip -> 7z) with optimal settings as they would strike to achieve the best compression with the best performance; the best compromise between the two. Optimal settings which strike a balance will differ with each user because I might prefer a bit more compression over speed, you might prefer a bit more speed over compression, so there is no real definitive best compromise that suites everybody. How come you didn’t rate WinRAR!?!? BTW, WinRAR when put thru VirusTotal returns Malware/Trojan warning! So, I stopped using it. Q: Does it really have Malware in it!?!? I like WinRAR and personally use it. This isn’t about not rating something and simply about hard facts, and the facts are during our tests WinRAR does fine when zipping but the RAR format really can’t live with 7z in terms of compression. I mentioned this before but Bandizip has a limitation with 7z files. It won’t let you edit the contents. Try creating a text file and store it to 7z archive. Then open it and try to edit, rename, or delete the file. It won’t let you. This automatically makes me unable to use Bandizip as my main archiving program. I think every other archiver lets you edit the contents of 7z files. Bandizip also does not offer file name encryption for 7z. 7-zip STILL has the flaw with their file name encryption. Create a text file and add it to 7z, password protect it, and choose encrypt file names. Then open the 7z and drag another file to the window and save it. Close and re-open. The file name encryption is gone. And there’s no way to add it back. You have to create a whole new archive. Very stupid. Also development for 7-zip is at a snail’s pace. I think Haozip is the best free one. It has good features and performance and none of these flaws, no disadvantages that I can see. I think it’s wise to keep several archiving programs in case one fails you but for main use Haozip gets my vote. I am surprised the test was for ZIP compression, and NOT RAR compression archiver’s. In my experience, RAR is by far a more popular compression format. Maybe the business world runs ZIP compression, but the internet (cyber lockers) almost “exclusively” use RAR. Raymond, Does RAR compression have a better algorithm (smaller size) than ZIP compression?? ZIP is still by far the most used compression format, among other things, you can ZIP/UnZIP something in any recent version of Windows without software. Most software that uses some form of compression will use ZIP as well, RAR is not a free format so cannot usually be used to compress files unless you pay to include it in your software, only decompress is free to use in RAR’s case. It’s not that cyberlockers use RAR, it’s all to do with “scene” rules and people uploading the content as it was compressed by the hackers and crackers that created it. In the Max compression test, WinRAR obviously uses RAR to compress. 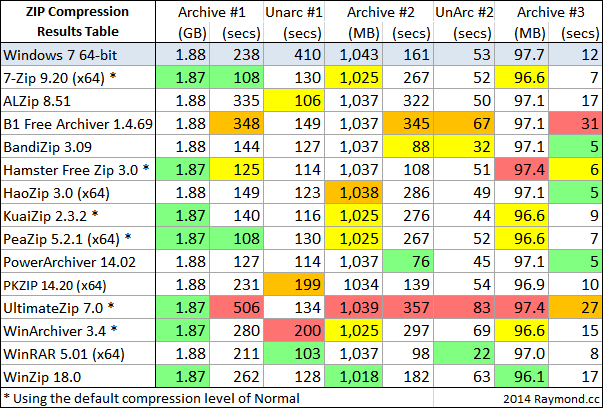 As you can see it doesn’t compress that great compared to 7z but is better than ZIP and comparable to ZIPX. IZArc isn’t included… ummm… why? Again? I’m not so much challenging your decision not to include it as I’m just wondering if I’m misguided in my long-term liking of it. I know it opens a whole lot of formats; and compresses a bunch, too. Sadly, the maker sometimes includes crapware/adware in the installer which can usually be opted-out of… except for this latest version does a little bit of a scare tactic that lit-up my anti-virus software at first; but, in the end, the badness somehow didn’t make it onto my machine. I sent him one of my angriest (but not abusive, mind you; but just really upset) emails ever. It almost put me off of IZArc, after all these years. But all that notwithstanding, I always thought that IZArc was one of the better ones; some say the best. Before IZArc started all this adware nonsense, it was one of the free archivers I would recommend to people because it was easy to use and supported quite a lot of formats. Offering crapware which you cannot opt out of crosses the line for me though. When you try to install, the first screen offers crapware, click Cancel and it cancels the IZArc install totally, click Next and it installs the crapware so you cannot choose not to install it. Reviews at download sites like CNET or Softpedia have torn IZArc to shreds in recent months, and rightly so in this case IMO…. Doing this in windows 7, I downloaded the files and the put 3 together in a folder on my desktop….. Which program and version are you using…? Thank you very much for this nice tests and article. And maybe thanks for the giveaway. Regards Sugart. Thank you very much for this informative piece! You didn’t note that none of the other programs will open an archive created with rar5 format in Winrar. The goal of this article is not to list exactly which archivers can open which archives, you’ll have to refer to the respective program or website for that. I’m not quite sure what your second comment means, 5.01 is the latest official version available and what was used for the test…. Bandizip, beginning with V 3.09 (it is exactly the version tested here). Maybe others in the rest can do that, I don’t know yet. For me, still working WinRAR and 7-Zip… Plus Bandizip, from 2013, after some personal tests; love it. I tried Haozip, Kuaizip, AlZip, UltimateZip and Winarchiver too, but Bandizip was my choice. Last month I tested an old friend, PowerArchiver, but the new version 2013 (v14, all builds) came with an ancient error of this software: the “Explorer needs to close” one. This bug was present in v12 too, but not in v13, figure it! Put simply, it’s a program very few people have heard of. If this was a test of 25 archivers it may have been included, but the 15 here are all far more well known and used. MagicRAR is probably one of the best ones that would be on this list, and a lot of people have heard about it, it just happens that you aren’t one of said people! I’ve heard of it before but virtually no-one else I know has. Apart from popping up in the odd giveaway and the advertising when it came out, MagicRAR is almost completely unknown. Great review Raymand. I too like 7zips more than other softwear to zip and unzip. YYZ! LoL. I have been using winrar on my old laptop for 1,172 days without a licensing key. Why you haven’t review that one? Glad to welcome you back and looking much forward to great reviews and hacking! Very nice comparison dear. I have long been using WinRAR and 7zip. But if I win this giveaway I will certainly change over to PowerArchiver 2013 . Thanks for the giveaway. Great article! Nice comparison. Thank you!. Hey Ray Thanks for your post ….. Since long you are not posting any great rebates or news !!!! Great article! I imagine it wasn’t that easy to compare them all. But even though I use 7Zip quite a lot, it takes time to get used to it, so I often recommend my friends B1 Free Archiver because of its interface. Speed isn’t everything. Thanks Tim, it’s never easy trying to pull 15 different programs together like this as many have their own issues or quirks and it’s difficult to keep the balance. UHARC is not included as it’s over 7 years old since the last release/update, all the tools here are recent versions and/or still in active development. Great list thanks. I was a huge fan of 7-Zip for years but it is not good for large directories with small files; it takes ages to compress these kinda folders with 7-Zip. I’ve tried Bandizip it is really much faster than 7-Zip. Thanks again. Nice comparison. Thank you!. After trying most of the freeware you tested, I settled on FreeArc for a couple reasons: its speed beats, and compression equals, 7-Zip (my previous favorite), and its encryption capabilities include both a number of algorithm choices and the ability to use a key file simultaneously or sequentially. PeaZip provided most of the same features, but adding files to an existing archive didn’t work well for me. Quite a bit of what I do is extremely confidential, and I need to store a backup in the cloud, so encryption is critical for me. You might want to consider that among the factors you use to compare file archivers. Don’t know if it would pass your Omni.ja test, though. I have used and then bought winrar years ago and never regret making the purchase. But I thought by now there should be better archive/compression methods since rar like zip is outdated by now. Have high hopes for 7z, also to look out for is Freearc which seems to be making waves recently. thanks for the writeup mate. sure was informative! been a couple of weeks since i got newletters form you, sigh! !